This morning I could feel that fall is around the corner. The night had been cool and the morning air was crisp. My naked feet got cold after walking and standing on the tile floor for some minutes. Cold feet never felt so good. The summer had been extremely hot with temperatures up to 113°F/45°C, and sometimes humid. I had really tried to take pleasure in my two least favorite months July and August but I was just happy when another day was over. It will still get pretty warm for at least 2 weeks but the worst for this summer is over, yeah!!! 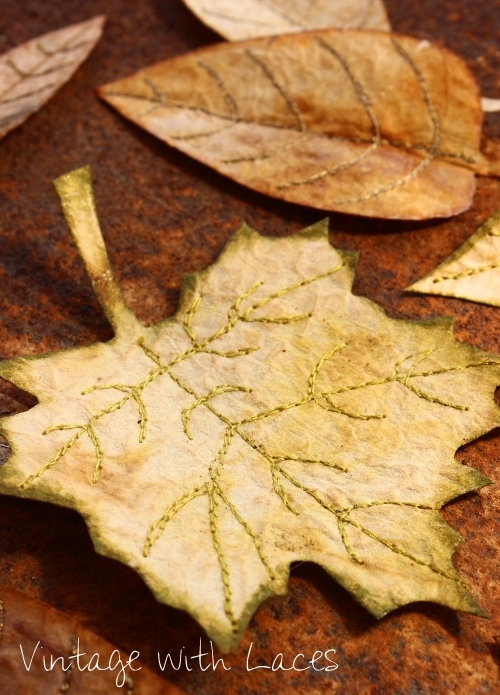 I'm going to celebrate fall with upcycled tea bag leaves which I had made some months ago. For most of my life I hadn't been much of a tea drinker but last fall I started to drink more tea. Mostly black tea but also green tea and fruit teas. The used tea bags were saved because I knew I could do something with them. I dried the tea bags in a bowl together with some rusty parts. The gray areas and spots you see on some of the leaves were caused by the rust reacting with the tannin contained in black and green tea. My bases for the leaves were crumbled pieces of brown paper bags from bakeries. I used double-sided fusible web to adhere tea bags to both sides. 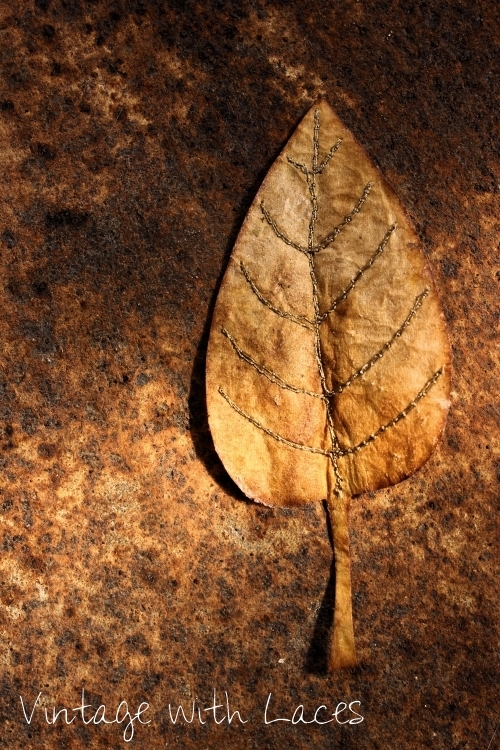 The leaf veins were free-motion embroidered. 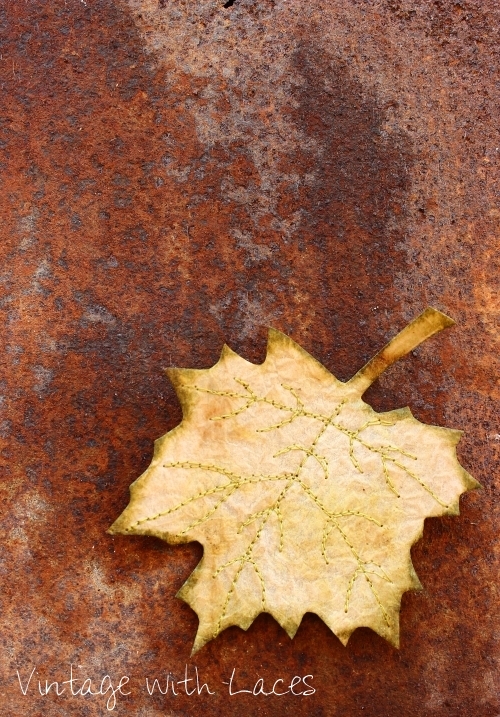 I like how the leaves look on that rusty piece of metal. They would as well look great hanging on a branch though. Have you decorated for fall already? Deine Idee, Teebeutel auf Rost zu trocknen ist einfach genial, so ist das Papier nicht so blass... und deine Arbeiten sehen auf den ersten Blick wirklich wie echte Blätter aus! Ich kann mir gut vorstellen, dass du dir nach dieser extremen Sommerhitze den kühlen Herbst herbei wünschst und sogar jetzt schon gefallene Blätter herbei zauberst. Wie sauber du die Blattadern genäht hast, sieht toll aus. Aber so hübsch ich deine Blätter auch finde, wünsche ich mir so sehr, dass uns hier noch ein paar warme Wochen hoffentlich vergönnt sind, ich mag gar nicht an die kalte Jahreszeit denken. Julia! These leaves are fabulous! My first thought when I saw the thumbnail is that they were real. I was so delighted to learn that you made them and I love the sewing for the veins. This is a very clever idea! they are amazing, so beautiful, dear friend. I am totally in love with them, and your idea. 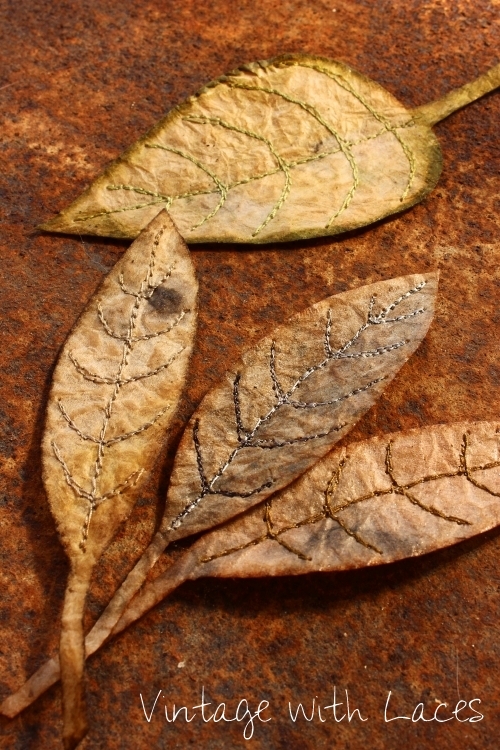 The freehand embroidery looks fabulous and the form of the leaves so looking like the real ones . I just have to try rusting the tea bags like this . You are phenomenal Julia . Thank you for your loving e-mail, you will hear from me sweetie. Knus og kys til dig . These leaves are really cool. It would never have occurred to me to use tea bags in such a manner but they are really unique and wonderful. TFS! Absolutely awesome!!! Thanks for sharing. Inspired use of tea bags and sooooo much nicer than folding them!! Also inspired use of the rust dye technique too! Ive a stash of dried tea bags somewhere too but this could work as well using colour catchers and Ive a whole carrier bag of those - again, somewhere!! After seeing your awesome autumn leaves, coloured in copper-y tones, with veins so delicately sewn, I was suddenly craving fall! Julia, your imagination and creativity never cease to amaze me! Thanks for sharing your leafy luxury! Hoping the cooler temps continue! 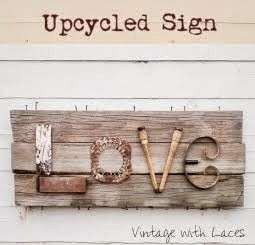 Great post - loved every word, every image!! Julia your creative heart comes through with this one. These are really cool. You go girl. These are fabulous. Happy Weekend. Gorgeous!! Such a creative idea and process. The colors the rust and tannin interaction produced are so natural and earthy. Love it! Julia I too hate the summer and this one was one of the worst I have experienced in my 21 years here in Greece. Like you I was happy to just make it thorough the day. I am looking forward to fall and all the pretty colors it will put on display for all of us. 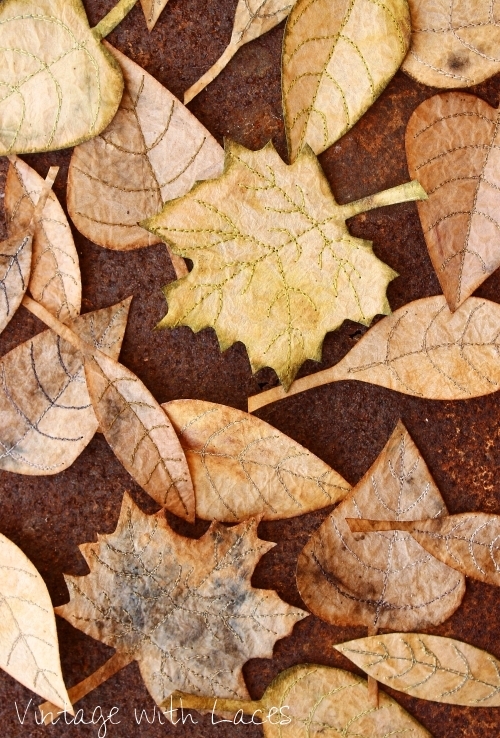 Your leaves are the perfect craft to put us in a fall mood. A whole different kind of tea bag art! Lovely! If you have a Facebook account, there is a small group for tea bag artists. Lots of ideas there. Even if you don't want to interact on Facebook, you only need the account to join a group. You might enjoy it! Those tea "leaves" came out beautifully. Love the different colors and random stains. I wonder now if I could do something with the used coffee filters with all the rich brown colors. Hmmm. Gotta try your project first. These are exquisite, Julia,and I'm so pleased that you shared your process. While I'm not ready for summer to end, I do love the color and feel of fall and these just say it so beautifully. The stains are so nice on the already-stained bags. Very nice. Thank you Julia for your great idea for the tea bags. You are very creative. Wow, Julia! Your leaves are amazing, creative and quite unique! These leaves look amazing! You are very creative! I love how they are stained from the tea and how you embroidered the veins on the leaves. They turned out beautiful! These are so beautiful Julia! I can´t get over that fantastic idea using tea bags. I´m not a tea drinker but might convert into one just for this! So pretty! The leaves are beautiful and perfect for fall. The black marks make them very realistic looking. It is still very hot here, but that is typical for August-September. Cant believe that these are made from Tea Bags. Wow, these are so awesome- I can't believe they're tea bags! Thanks for sharing this idea! I hope some of this creativity will rub off on me! The leaves are wonderful and stunning. This is a very creative idea. Congratulations Julia, your project is the most popular over at Sweet Inspiration Link Party! eine geniale Idee! Die Blätter schauen so echt aus. Ich bin mir sicher, daraus lassen sich vielerlei hübsche Herbstdekorationen zaubern. Auch bei uns wird es langsam herbstlich. Heute war es regnerisch und ziemlich kühl. deine upgecycelten Teebeutel sind ja der Hammer! Ich kann mir das gar nicht wirklich vorstellen - sind das irgendwelche speziellen (größeren) Teebeutel? Denn die Beutelchen hier, die sind einfach winzig und sehr transparent... Auf jeden Fall bitte unbedingt auch bei ANL verlinken (ab 15.9. gibt's ein neues Linkup), denn wiederverwertete Teebeutel sind echt Recycling in Reinkultur! Dank dir sehr für deine lieben Kommentare und auch sehr für deine Mail! Ich werde dir demnächst drauf antworten. Dieses WE bin ich zu kaum etwas gekomen, denn gestern hatten wir wieder (nach einem Jahr Pause) die Oldtimer-Rallye und waren von morgens bis abends mit der Kamera unterwegs... und heute einfach nur streichfähig. Hier ist es übrigens jetzt auch wieder kühler, seit gestern. Ich atme so auf wie du! These are so creative and beautiful, Julia! You're being featured this week at Talk of the Town - thanks for linking up! Deine Teepapier"blätter" sind sowas von genial- die zarten genähten Venen und wie speziell verarbeitet! Großartig! Dabei hat sich hier so viel getan! Ich bin begeistert von den Denim-Armbändern, die veröffentlicht wurden und den von den Holzskulpturen . die sind einmalig!! Ich wünsche Dir einen schönen Herbst nach der Hitze! Oh my Julia!! These look so real!! Such a beautiful creative project!! Who would have thought tea bags would make something so stunning! 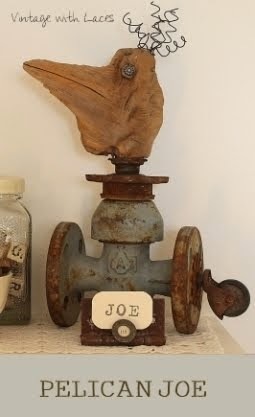 Thank you for sharing your amazing project with us over at Waste Not Wednesday! Very clever and creative. Thanks for sharing with us at the Waste Not Wednesday link party. That's very special to read how you've made these leaves. They are really amazing and a great creative idea for the coming fall period. So very nice!! You must have drink a lot of tea Julia...hihi...!! These are gorgeous, Julia. So creative and so unique!!! You are so very clever and it is lovely to see what you have done with your teabags. Gives a whole new life for the simple teabag that normally gets thrown out. We drink a lot of tea here. Oh my goodness! Your leaves are the most gorgeous things ever! You are so talented!